Art Buchwald was a great satirist. Back when we had quality journalists. It does show that people did not get that upset about wife spankings back in the day. 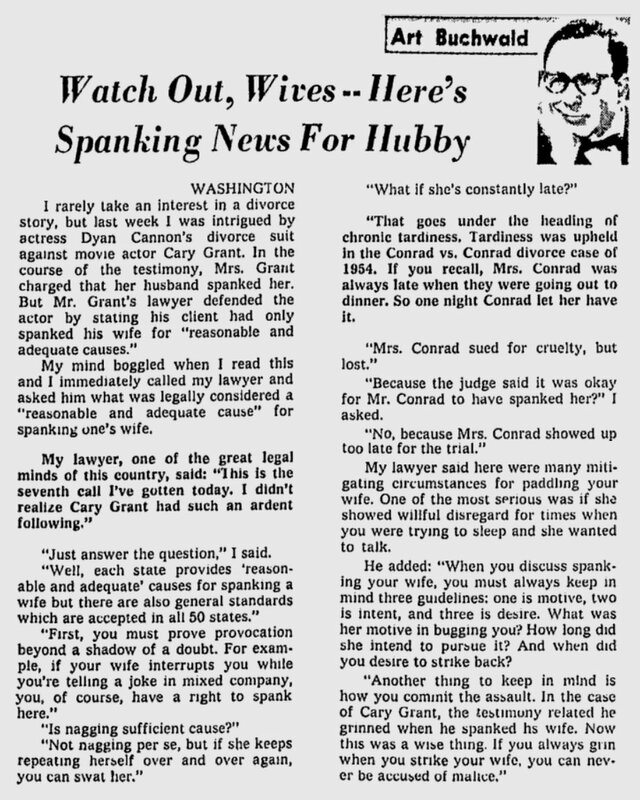 I believe there was a law in Arkansas that a man could beat his wife once a month, whether she deserved it or not. I am not so sure the precedents were dodgy. Even before the Rump Parliament of 1648, English maritime law recognized the use of spanker sails on square-rigged ships, which, of course were always referred to using feminine pronouns. The best actors and actresses draw on personal experiences to bring something to the characters they play. It would not surprise me if Ms. Cannon did likewise, when she played the part of Judge Jennifer ‘Whipper’ Cone on the TV show, Ally McBeal.